The 2010 Singapore Grand Prix (formally the 2010 Formula 1 SingTel Singapore Grand Prix) was a Formula One motor race held on 26 September 2010 at the Marina Bay Street Circuit, Marina Bay, Singapore. It was the fifteenth race of the 2010 Formula One season, and the third Singapore Grand Prix held as part of the Formula One World Championship. The 61-lap race was won by Ferrari driver Fernando Alonso who started in pole position. Sebastian Vettel finished second for Red Bull, his teammate Mark Webber was third. Alonso held off Vettel to maintain his start line advantage on the first lap. Lewis Hamilton, who started third, fought off teammate Jenson Button to retain his start position. The top two remained the same through the first and only round of pit stops. Webber's team, Red Bull, opted to pit him early allowing him to move ahead of Hamilton. The race was neutralised by the deployment of the safety car after Kamui Kobayashi and Bruno Senna crashed on lap 31. Hamilton retired after a collision with Webber shortly after the race restarted on lap 36. Alonso maintained his lead throughout the remainder of the race despite pressure from Vettel. The race was Alonso's second consecutive victory and his fourth of the 2010 season; he had started from pole position to win the Italian Grand Prix two weeks earlier. The win meant Alonso moved into second place in the World Drivers' Championship, eleven points behind leader Webber. Hamilton's retirement meant he slipped to third, while Vettel's second-place finish moved him into fourth ahead of Jenson Button. In the Constructors' Championship Red Bull extended its lead to twenty-four points ahead of McLaren. Ferrari was a further forty points behind, with four races remaining in the season. The 2010 Singapore Grand Prix was the fifteenth round of the 2010 Formula One season after taking a two-week break from the previous race in Italy. The event was held at the Marina Bay Street Circuit in Marina Bay, Singapore on 26 September 2010. The Grand Prix was contested by twelve teams with two drivers each. The teams (also known as constructors) were: McLaren, Mercedes, Red Bull, Ferrari, Williams, Renault, Force India, Toro Rosso, Lotus, Hispania, Sauber and Virgin. Tyre supplier Bridgestone brought four different tyre types to the race: two dry compounds (super soft "options" and medium "primes") and two wet-weather compounds (intermediate and full wets). The soft compounds were denoted by a green stripe on their side-walls; the wet compound tyres were identified by a green line at the bottom of their central groove. The rules of 2010 Grand Prix races stipulated that all cars should use both types of tyre during a race unless the driver used any one of two wet-weather compounds. Each driver was limited to eleven sets of dry tyres for the weekend. Before the race, Red Bull driver Mark Webber led the Drivers' Championship with 187 points. He was ahead of Lewis Hamilton in second with 182 points and Fernando Alonso in third on 166 points. Hamilton's teammate Jenson Button was fourth with 165 points, and Sebastian Vettel was fifth on 163 points. Red Bull was leading the Constructors' Championship with 350 points; McLaren and Ferrari were second and third with 347 and 290 points respectively, while Mercedes on 158 and Renault with 127 points contended for fourth position. Red Bull, McLaren, and Ferrari had won the previous fourteen races of the season (with victories being taken by Alonso, Button, Vettel, Hamilton and Webber). Felipe Massa (twice), Robert Kubica had finished in second place, and Nico Rosberg (three times), Massa (twice) and Kubica (once) had all finished in third. Singapore was a critical race in the championship as all five drivers had a chance to take the lead with a victory. The situation was made difficult for Alonso as he had used his allocation of eight engines following the Italian Grand Prix, and to replace one would incur a ten-place grid penalty. His rivals each had at least one untouched engine in reserve; Webber had two. Nevertheless, Alonso set himself the target to score points in Singapore. He also acknowledged that his car was not the fastest in the field and felt he needed five podiums in the season's five remaining races. Webber stated that he was expecting Singapore to be a tough weekend for him after he had retired from the event in 2008 and 2009, but felt there was still some time before a driver clinched the championship. After crashing out of the first lap of the Italian Grand Prix, Hamilton said he would push hard to stay in the running for the championship: "I'll take each race as it comes, but I'll also be making sure I get to the finish of the next five races, that's more important than anything. I go to Singapore to win." Hamilton felt Alonso was the favourite to win the Grand Prix and viewed the latter as his main rival for the Drivers' Championship which was shared by Red Bull team principal Christian Horner. Button himself believed Alonso would have an extra advantage as the latter's teammate Massa was out of contention for the title. The Marina Bay Street Circuit was resurfaced between turns three and seven, along with turns thirteen to seventeen, after drivers complained about its bumpiness following the 2009 Singapore Grand Prix. The Singapore Sling chicane was adjusted to allow for a more gradual curve to exist which enabled a safer exit for drivers. The outside wall at turn 21 was brought closer towards the race track to cover up half of a drain which was previously exposed to cars, and the pit lane was resurfaced to allow for a smoother exit for drivers rejoining the circuit. Hamilton, a vocal critic of the circuit's condition, described it as "dangerous" because it had remained uneven, and said the Singapore Sling chicane was "the worst corner I have ever driven in Formula One" despite the safety modifications made to it. The organisers of the Singapore Grand Prix introduced a new machine to clean the surface of the track after drivers had problems with a dusty and slippery track surface in the previous year's race. Two days before the first practice session, drivers expressed concerns over low visibility caused by rain showers combined with the glare from the circuit lighting. There were two driver changes heading into the Grand Prix. Hispania Racing announced that Sakon Yamamoto, one of the team's drivers since the tenth race of the season, was to be replaced for the weekend by the team's reserve driver Christian Klien because he was suffering from food poisoning. Several journalists noticed a seemingly healthy Yamamoto in the paddock, suggesting that he had been dropped for sponsorship reasons instead. Team principal Colin Kolles confirmed that the arrangement would be for one race and Yamamoto would return to the cockpit at Suzuka. Pedro de la Rosa was summarily dropped by Sauber and replaced by Pirelli test driver Nick Heidfeld, who last drove for the Sauber team in 2009. The change was made because of de la Rosa's poor performance relative to that of teammate Kamui Kobayashi, and Heidfeld's knowledge of the Marina Bay Street Circuit and the Yas Marina Circuit. Several teams made modifications to their cars in preparation for the event. McLaren, Red Bull, and Williams all revised their front wings. McLaren's revision was designed to separate airflow into two separate channels, with both directing airflow around the outside of the car's front tyres. Red Bull's design, used in the Friday practice sessions, had two vertical slots to the rear of its endplate along with another to avoid creating a vortex when it operated with the planes and endplate. A previous design, debuted at the British Grand Prix, was used both in qualifying and in the race. In addition, the team used a revised diffuser to allow for better management of airflow to the top of the diffuser's side section. Williams's design debuted for the first time and was designed to make the tyre act like a diffuser which took air in to improve its efficiency. Adrian Sutil, who damaged his Force India's suspension in a crash during the second practice session. Three practice sessions—two on Friday and a third on Saturday—were held before the main Sunday race. The Friday afternoon and evening sessions each lasted ninety minutes. The third session was held on Saturday afternoon and lasted an hour. The first practice session was initially held on a wet track with a clear sky after rainstorms earlier in the day left standing water on parts of the circuit, and high humidity slowed the drying process. These conditions meant drivers used intermediate tyres first before dry tyres were utilised in the session's closing minutes. Webber set the fastest time of the first session with a late lap of 1 minute and 54.589 seconds, one-tenth of a second faster than Michael Schumacher in second who was briefly quickest before Webber set his lap. Adrian Sutil, with a lap of 1:58.827, was third fastest, ahead of Vettel and Jaime Alguersuari. Button, Vitantonio Liuzzi, Sébastien Buemi, Kubica, and Vitaly Petrov rounded out the session's top ten fastest drivers. In the second practice session, when the track was still damp in some sections, Vettel set the fastest time of the night, a lap of 1:46.660 on super-soft tyres; Webber finished with the second fastest lap. Button drove aggressively and battled Vettel for the fastest time throughout before he ended with the third quickest lap, half a second off Vettel's pace. Alonso, who was fourth fastest, ran wide at turn 17 while on a quick lap and slid down the access road at the next corner; he stalled while attempting to rejoin the track and abandoned his car requiring marshals to push his Ferrari away from the track. Hamilton was fifth, with Barrichello and Massa in sixth and seventh places. The two Mercedes drivers were eighth and tenth; with Nico Rosberg ahead of Schumacher, separated by Kubica. Sutil's Force India was launched into the air when he hit a kerb at the Singapore Sling chicane and his front-left suspension was broken upon landing requiring him to miss half the session, and Alguersuari's left-rear tyre made contact with a barrier but he avoided major damage to his car. Sutil was fined US$10,000 (£6,300) by the stewards because he attempted to drive back to the pit lane in his damaged car and did not stop at a safe position on the circuit. Rain hit the circuit on Saturday afternoon, ending three hours before the session started, resulting in several damp patches on the circuit though the air temperature remained hot. Different sections of the circuit dried out at different rates making it difficult for drivers to tell precisely how wet or dry certain corners were. The teams ran intermediate tyres before switching to the super-soft tyre as the session progressed. Some drivers ran deep into turn five. Vettel was the fastest driver of the session with a time of 1:48.028 set in the last twenty minutes of the one-hour period. The time was four-tenths faster than championship rival Alonso. Hamilton was third fastest, two-thousandths of a second in front of Massa. Rosberg was fifth, ahead of Webber and Nico Hülkenberg. Kubica, Sutil and Buemi completed the top ten ahead of qualifying. Hispania Racing driver Bruno Senna's right-rear tyre got onto a white line at the Singapore Sling chicane and spun. Senna later brushed a wall entering the Esplanade Bridge in the final minute and stopped his car, causing the yellow-flags to be shown; drivers were unable to improve on their lap times because of the limited time available. Saturday evening's qualifying session was divided into three parts. The first part ran for twenty minutes and eliminated the cars that finished the session eighteenth or lower. The second part of qualifying lasted fifteen minutes and eliminated cars that finished in positions eleven to seventeen. The final part of qualifying determined the positions from first to tenth and decided pole position. Cars which competed in the final qualifying session were not allowed to change tyres before the race; these started the race fitted with the tyres with which they set their quickest lap times. It was held in dry weather conditions. Alonso was fastest in the first and third sessions, and clinched his second consecutive pole position with a lap time of 1:45.390 which he set on his first run of the third session. He was restricted to one timed lap in the second session because of an engine mapping problem, which meant Ferrari immediately re-programmed Alonso's engine upon discovering the issue. Alonso was joined on the front row of the grid by Vettel, who recorded a lap 0.067 seconds off Alonso's pace, and felt he could have taken pole position as he misjudged a gap while following Schumacher and brushed the wall exiting the Singapore Sling chicane. Hamilton qualified third and was happy with his starting position despite losing downforce on the track's final sector while running in teammate Button's tow. Button secured fourth and pushed hard in the final session which meant he had slight damage to his rear tyres on his first run, and could not get the optimum tyre temperature in the first section on his second run. Webber managed fifth and admitted that he was struggling to find a good rhythm when driving the circuit. Barrichello qualified in sixth. The two Mercedes drivers took seventh and ninth; Rosberg ahead of Schumacher. Rosberg believed that he should have performed better in qualifying than in the practice session, as he felt the soft tyres lacked grip; Schumacher was satisfied with his qualifying performance. The Mercedes drivers were separated by Kubica, in the faster Renault, who was happy with his lap time despite his car sliding from a lack of grip. Kobayashi rounded out the top ten qualifiers. Felipe Massa used his ninth engine of the season after his gearbox failed in qualifying. Alguersuari, who qualified eleventh, was the fastest driver not advancing to the final session. His best time of 1:47.666 was 1.8 seconds slower than Vettel's pace in the second session. Alguersuari's time was followed by Hülkenberg, who was backed up by Sutil on his first run in the second session, and described his car's balance like "night and day". However, Hülkenberg was demoted five positions on the grid after the Williams team changed his gearbox after the race at Monza. As a consequence, Petrov inherited 12th position having pushed hard on a set of option tyres. He had lost control of his car after he went deep, under braking, heading for turn five (a corner that was damp from the earlier rain shower), with his right-rear wheel hitting the wall. Petrov's crash meant he took no further part in qualifying. He was ahead of Buemi, in the slower of the two Toro Rossos, who lost a large amount of grip and got stuck in traffic. Heidfeld took 14th ahead of his fellow countryman Sutil in 15th. Liuzzi had a problem with his front brakes on the first run of the second session and managed 16th. Timo Glock, Heikki Kovalainen and Lucas di Grassi were the quickest drivers unable to advance beyond the first part of qualifying. The eleventh row of the grid was filled by Jarno Trulli and Klien. Senna took 23rd. Massa was unable to set a timed lap as his gearbox seized without warning forcing him to stop on the circuit; Ferrari chose to replace his engine and gearbox as a precaution. Massa's engine change was his ninth of the season which incurred a ten-place grid penalty, but since he started from 24th position, the penalty was nullified. Fernando Alonso won his fourth race of the season in Singapore and achieved the first Formula One Grand Chelem since 2004. The race began at 20:00 Singapore Standard Time (UTC+8). The conditions on the grid were dry and cloudy before the race; the air temperature ranged between 29 to 32 °C (84 to 90 °F) and the track temperature was 31 °C (88 °F); no rain was predicted during the race. Most drivers started on the super-soft compound tyre. Alguersuari started from the pit lane as his team discovered a coolant leak in his car. As the five red lights went out to signal the start of the race, Alonso maintained his pole position advantage heading into the first corner and withstood Vettel's attempt to pass him. Button got an early advantage over teammate Hamilton, but Hamilton fought him to retain third place. Barrichello fell from sixth to eighth place. Kubica passed Rosberg at the start but the German regained the sixth position in the same lap. Further down the field, the early momentum was broken when Heidfeld, attempting to overtake both Force India cars at turn seven, hit Sutil's rear, damaging his front wing. Liuzzi subsequently went into Heidfeld's rear-end after the latter squeezed him towards the wall, causing front wing damage to his car. Heidfeld made a pit stop for a replacement front wing at the end of lap one, while Massa made his sole pit stop for the medium compound tyres. Liuzzi pulled over to the inside of the circuit on the third lap, at turn ten, with left-rear suspension damage resulting from contact with the wall. His retirement triggered the deployment of the safety car as marshals were required to push his car away from the track. Webber was the only top running driver to pit for the medium compound tyres during the safety car period on lap four. Red Bull had told Webber to enter the pit lane, assuring him that it was the right decision, though he questioned the move. Several drivers towards the rear also chose to pit. Racing resumed at the end of lap five when the safety car pulled into the pit lane. Webber immediately pushed hard and passed Glock for tenth position and a line of cars began to form behind Glock. Alonso began to pull away from Vettel as he set consecutive fastest laps. Webber passed Kobayashi at turn five to move into ninth on lap seven, and withstood an attempt to Kobayashi to reclaim ninth heading into turn seven. Hülkenberg and Petrov's wheels made contact and both drivers went off the circuit on the same lap; Hülkenberg managed to move ahead of Petrov with Massa taking advantage to pass Petrov. Webber caught Schumacher on lap 11 and passed the latter on the same lap at turn five after Schumacher ran wide. Vettel was told by his team to cool his brakes on the same lap as Alonso continued to extend his lead. Sutil got ahead of Glock for eleventh place three laps later and started to pull away from the queue behind Glock. Hülkenberg ran wide at turn seven on the same lap but did not lose any positions. Hülkenberg passed Glock in the first sector of the track for twelfth on lap 16. Sebastian Vettel finished second and moved up into fourth in the Drivers' Championship. Vettel and Alonso traded fastest laps as they pushed hard in their efforts to build up a sufficient lead over Webber to maintain first and second positions after their pit stops. Massa, Petrov, Buemi and Alguersuari all passed Glock on lap 17 thus eliminating the queue of cars. By lap 20, Alonso was leading Vettel by 3.2 seconds; he in turn was a further 11 seconds in front of Hamilton. Button was in fourth, 20 seconds behind Alonso, with Rosberg 3.3 seconds behind the World Champion in fifth. Webber changed his engine settings to give him a higher top speed in an attempt to get past Barrichello and decrease the time gap to Hamilton on lap 22. He avoided colliding with an Armco barrier at the entry of turn eighteen one lap later. Hamilton was told to increase his pace on the 24th lap to try to stay ahead of Webber after the pit stop phase. But his car had a large amount of oversteer, as his rear, super-soft, compound tyres began to deteriorate, causing his lap times to drop off the leader's pace. Trulli drove to the pit lane and was pushed by his mechanics into the Lotus garage to retire with an hydraulic issue on lap 28. Hamilton made the first scheduled stop for tyres on lap 29 and re-emerged in eighth position behind Webber. Alonso and Vettel made simultaneous pit stops on the following lap; Alonso retained his lead despite Vettel's pit crew completing their pit stop first; Vettel avoided stalling and drove away in second gear. With newer tyres which provided more grip, Vettel recorded faster lap times than Alonso to close the time gap as the two came across slower cars. Kobayashi attempted to pass around the outside of Schumacher on lap 31 but the two made contact with Schumacher subsequently hitting a barrier. Kobayashi damaged his Sauber, losing control of his rear-end, and crashed at the exit of turn 18 after his front wing was knocked off entering the corner. Senna was slow to react and buried his Hispania nose-first into the barrier alongside Kobayashi. These incidents called for the race's second safety car period to allow removal of both cars from the circuit which were on the racing line. Klien was pushed into his garage to retire with an hydraulic problem on lap 34. The safety car pulled into the pit lane at the end of lap 35 and the race resumed with Alonso leading. Hamilton got a run on Webber who was caught behind di Grassi and lined up an overtaking manoeuvre on Webber, and overtook him on the Raffles Boulevard straight. Webber's front-right tyre hit Hamilton's left-rear tyre at turn seven. He escaped without significant damage, while Hamilton had a punctured tyre and pulled off the circuit to retire for the second consecutive race. However, Webber did feel vibrations on the front-end of his Red Bull. His tyre, which made contact with Hamilton's, had been pushed five millimetres (0.20 in) off its normal mounting on the rim, and Button drew closer to Webber who managed to maintain a good pace. On lap 37, Schumacher went into Heidfeld's rear-end and limped back to the pit lane to replace his damaged front wing creating sparks as it was dragged along the surface of the track, while Heidfeld retired after hitting a barrier. Button was urged by his McLaren mechanics on lap 42 to push Webber whose tyres were older, while Vettel gradually closed the gap with Alonso. Hülkenberg, in ninth, made a mistake on lap 44 which allowed Massa to momentarily take advantage, but he fought back and retained ninth position. Kubica sustained a right-rear puncture on lap 46 and made a pit stop on the same lap, rejoining in 13th. Mark Webber finished third after stopping early for tyres and increased his championship lead. Upfront, Vettel had reduced the gap between himself and Alonso to one second by lap 50 as the pair continued to trade the fastest lap time. Glock started to slow on the circuit and drove to the pit lane to retire. It was later confirmed that his retirement was the result of an issue with his car's hydraulic system. With the advantage of having newer tyres which gave him more grip, Kubica was able to make short work of Alguersuari, Buemi, his teammate Petrov, Massa, Hülkenberg, and Sutil (who was holding up a queue of five cars) in the space of nine laps. Vettel continued to pressure Alonso in the closing laps as the pair began to encounter slower cars. Kovalainen and Buemi made contact in the final sector of the lap, with the latter spinning around in front of the Toro Rosso, who was quick to avoid a head-on collision. Kovalainen's car suffered a cracked fuel tank pressure release valve and he limped back to the pit lane, the rear of his Lotus catching fire during the final few turns. Kovalainen aborted the pit entry, but did not make it much further as his car was consumed by the fire. Kovalainen stopped on the main straight and got out of his car to extinguish the fire himself after members of the Williams team handed him a fire extinguisher. As Kovalainen was off the racing line, yellow flags were waved in the final corners instead of a safety car deployment. Vettel drew to within two-tenths of a second behind Alonso as the final lap started, and came across Sutil, Hülkenberg, Petrov and Massa; both drivers managed to get past Petrov, and Alonso maintained the first position heading into the final sector of the track. The yellow flag for Kovalainen's car meant that Vettel's final chance of an overtake, into the final corner, was denied, and Alonso took the checkered flag on lap 61 to win the race, 0.293 seconds ahead of Vettel. Alonso secured the first, and, as of 2015, the only Grand Chelem (leading the entire race from pole position with fastest lap) of his career as well as the first since Schumacher achieved the feat at the 2004 Hungarian Grand Prix. Webber was third, 1.2 seconds ahead of Button in fourth. Rosberg, Barrichello and Kubica took the next three positions. Sutil held off Hülkenberg in the final sector of the track for eighth and ninth on the line with Massa in tenth. Petrov, Alguersuari, Schumacher and Buemi finished one lap behind Alonso, with di Grassi and Kovalainen (despite his retirement) the last of the classified finishers. The top three drivers appeared on the podium to collect their trophies and, in a later press conference, Alonso said that his victory "meant a lot" for him to remain in contention for the Drivers' Championship and thanked his team for their efforts during the weekend. Alonso added that Ferrari would give "100 per cent" in the season's four remaining races and said the battle remained "very tight" despite scoring the most points out of all the drivers in the previous five races. Vettel said that he was hoping that Alonso would make a mistake but acknowledged that it was difficult to overtake on the circuit. He also said that attempting to overtake Alonso in the final stages of the race was "the only chance" that he had of winning the race and hoped that the remaining tracks would suit his Red Bull car. Webber stated that he was "very happy" with his third-place finish and said the entire race weekend was the toughest of the year on him. He also said that he did not feel comfortable throughout the weekend and that he was staying composed through certain sections of the race. Alonso's win has been regarded as one of the best of his Formula One career. Former Formula One driver Martin Brundle described it as: "one of those races in which two drivers elevate themselves on to a separate plane from their rivals." It reminded him of the 2000 Japanese Grand Prix where Schumacher won that year's world championship from his main rival Mika Häkkinen. Will Saunders of crash.net said in 2014 that Alonso: "had little right to wrestle a performance of such magnitude out of either himself or the Ferrari, yet he found another level that day." After the eventual conclusion of the championship in Vettel's favour by four points, Saunders said: "Alonso's performance in Singapore showed he would have been an equally deserving championship victor." ESPN listed it as one of Alonso's top ten races while driving for Ferrari. The stewards immediately investigated the accident between Webber and Hamilton on lap 37 and took no further action. Hamilton later reviewed the incident on video and was adamant that he was not at fault saying that he was "unlucky" for the second consecutive Grand Prix. Webber stated the contact nearly forced him to retire and compared the accident to Hamilton's collision with Massa at the Italian Grand Prix. Brundle felt Hamilton should have given Webber more space and agreed with the stewards' decision. Bridgestone director of motorsport tyre development Hirohide Hamashima stated Webber was "very lucky" to make the finish and that if left hand high-speed corners were installed on the track, the tyre would have moved more frequently and lost its pressure. Horner had also admitted that Webber had been lucky with his tyre lasting for a long distance. Schumacher and Heidfeld's accident on lap 37 was investigated by the stewards who took no further action after deciding it was a "racing incident". Heidfeld felt Schumacher had braked too late and hoped that he would have had a better finishing position. Schumacher himself said that he was not happy with his first race in Singapore but enjoyed the second half of the race. BBC pundit, and former team principal, Eddie Jordan was highly critical of Schumacher arguing that the latter should have been sacked by Mercedes to prevent him from being "slaughtered" in the event he was unable to win another race. Mercedes team principal Ross Brawn came to Schumacher's defense and said his team was "happy" with his contribution. Motorsport pundits criticised Kovalainen's decision to stop his car on the pit straight after it had caught fire and argued that he was "irresponsible". Kovalainen defended his action arguing that it had not been safe to drive his Lotus into the pitlane. Nevertheless, Kovalainen's fire was voted the Moment of the Year by readers of Autosport magazine in December 2010 at the Autosport Awards held in London. Sutil was given a 20-second time penalty by the stewards as he was deemed to gain an advantage by taking the outside line at turn seven on the first lap. This demoted him from eighth to tenth, and promoted Hülkenberg from ninth to eighth and Massa from tenth to ninth. Following a protest from Force India, Hülkenberg was issued a 20-second time penalty after the stewards deemed him to have gained an advantage by corner cutting. This ruling meant Hülkenberg was demoted to tenth while Massa moved up to eighth and Sutil inherited ninth. Force India withdrew an appeal of Sutil's penalty following the decision, and Williams technical director Sam Michael said that his team had accepted the stewards' judgement. The stewards elected not to penalise Senna after examining a video of his collision with the stationary Kobayashi. Kobayashi admitted that he was at fault for his retirement and Senna believed the marshals were late reacting to Kobayashi's accident and felt his own accident was unavoidable. As a consequence of the race, Webber's third-place finish allowed him to increase his lead in the World Drivers' Championship. 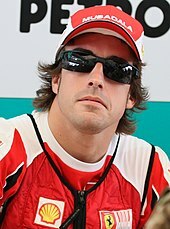 Alonso's victory allowed him to move up into second place, eleven points behind Webber. Hamilton's retirement meant that he slipped to third place, nine points behind Alonso. Vettel's second-place finish resulted in him moving into fourth place ahead of Button. In the World Constructors' Championship, Red Bull's strong finish allowed them to draw further ahead of McLaren who were now twenty-four points behind. Ferrari remained in third on 319 points, forty points behind McLaren. Mercedes increased their points advantage over Renault to thirty-five with four races remaining in the season. ^ – Nico Hülkenberg was given a five-place grid penalty for changing his gearbox after the Italian Grand Prix. ^ – Felipe Massa failed to set a lap time after stopping on the circuit in the first part of the qualifying session. ^ – Ferrari replaced Massa's gearbox and engine – his ninth for the season – after his stoppage in qualifying; Massa could not be penalised because he had already qualified last after failing to set a time. ^ – Adrian Sutil was penalised 20 seconds post-race for illegally gaining an advantage at turn seven on the first lap. ^ – Following a protest by Force India, Hülkenberg was penalised 20 seconds post-race for illegally gaining an advantage. ^ – Jaime Alguersuari started from the pit lane following a coolant leak before the race. ^ "2010 Formula 1 SingTel Singapore Grand Prix". Formula1.com. Archived from the original on 12 July 2010. Retrieved 12 December 2015. ^ a b c d e f g h i j k l m n o p q r s t Creighton, Geoff; Hughes, Emlyn (26 September 2010). "As it happened: Race day in Singapore". Autosport. Haymarket Publications. Archived from the original on 28 September 2010. Retrieved 19 September 2010. ^ a b Symonds, Pat. "Race Debrief". F1 Racing. Vol. November 2010 no. 177. p. 107. ^ a b c d e "Grand Prix Results, Singapore GP, 2010". GrandPrix.com. Inside F1, Inc. 26 September 2010. Archived from the original on 13 November 2015. Retrieved 27 October 2015. ^ "Vettel sets fastest lap in Singapore GP friday practice". BridgestoneMotorsport.com. 24 September 2010. Archived from the original on 14 November 2015. Retrieved 18 September 2015. ^ a b c d "2010 Formula One Sporting Regulations" (PDF). Fédération Internationale de l'Automobile. 11 February 2010. Archived from the original (PDF) on 20 August 2010. Retrieved 26 May 2015. ^ "Bridgestone Motorsport announces 2010 F1 tyre specifications". BridgestoneMotorsport.com. Archived from the original on 4 August 2015. Retrieved 4 August 2015. ^ a b c d e f "2010 Championship Classification". Fédération Internationale de l'Automobile. Archived from the original on 28 October 2010. Retrieved 26 May 2015. ^ a b c d e f g "Night spectacle to unfold in Singapore". motorsport.com. 24 September 2010. Archived from the original on 14 November 2015. Retrieved 18 September 2015. ^ a b Holt, Sarah (23 September 2010). "Fernando Alonso is main threat – Lewis Hamilton". BBC Sport. Archived from the original on 24 September 2010. Retrieved 7 November 2015. ^ "Singapore Sling Chicane modified once again". GPUpdate. JHED Media BV. 22 September 2010. Archived from the original on 24 September 2010. Retrieved 18 September 2015. ^ Weaver, Paul (24 September 2010). "Lewis Hamilton condemns 'dangerous' Singapore grand prix circuit". The Guardian. Archived from the original on 14 November 2015. Retrieved 19 September 2015. ^ "Singapore introduces new track cleaning machine". GPUpdate. JHED Media BV. 22 September 2010. Archived from the original on 24 September 2010. Retrieved 22 November 2015. ^ Arron, Simon (2010). "Grands Prix 2010: Singapore Grand Prix". Autocourse 2010–2011. Malvern: Icon Publishing. p. 242. ISBN 978-1-905334-57-5. ^ Beer, Matt (24 September 2010). "Klien to deputise for Yamamoto". Autosport. Haymarket Publications. Archived from the original on 27 September 2010. Retrieved 24 September 2010. ^ Cooper, Adam (14 September 2010). "Sauber confirms Heidfeld in, de la Rosa out". Adam Cooper's F1 Blog. Archived from the original on 17 September 2010. Retrieved 14 September 2010. ^ "McLaren MP4-25 – revised front wing". Formula1.com. 25 September 2010. Archived from the original on 28 September 2010. Retrieved 19 September 2010. ^ "Red Bull RB6 – revised front wing". Formula1.com. 26 September 2010. Archived from the original on 29 September 2010. Retrieved 19 September 2010. ^ "Red Bull RB6 – revised diffuser". Formula1.com. 26 September 2010. Archived from the original on 30 September 2010. Retrieved 19 September 2015. ^ "Williams FW32 – new front wing". Formula1.com. 26 September 2010. Archived from the original on 29 September 2010. Retrieved 19 September 2015. ^ Rae, Richard (24 September 2010). "Mark Webber fastest in first practice at Singapore GP". BBC Sport. Archived from the original on 25 September 2010. Retrieved 19 September 2015. ^ a b c Beer, Matt (24 September 2010). "Webber tops damp opening practice". Autosport. Haymarket Publications. Archived from the original on 26 September 2010. Retrieved 19 September 2015. ^ a b Rae, Richard (24 September 2010). "Red Bull's Sebastian Vettel fastest in second practice". BBC Sport. Archived from the original on 25 September 2010. Retrieved 19 September 2015. ^ "Vettel best in second Singapore practice". GPUpdate. JHED Media BV. 24 September 2010. Archived from the original on 27 September 2010. Retrieved 19 September 2015. ^ "Sutil fined $10,000 for Friday incident". GPUpdate. JHED Media BV. 25 September 2010. Archived from the original on 28 September 2010. Retrieved 19 September 2015. ^ a b c "Vettel heads final practice in Singapore". GPUpdate. JHED Media BV. 25 September 2010. Archived from the original on 26 September 2010. Retrieved 23 October 2015. ^ a b c Glendenning, Mark (25 September 2010). "Vettel on top again in final practice". Autosport. Haymarket Publications. Archived from the original on 28 September 2010. Retrieved 23 October 2015. ^ Creighton, Geoff; Hughes, Emlyn (25 September 2010). "As it happened: Qualifying". Autosport. Haymarket Publications. Archived from the original on 28 September 2010. Retrieved 24 October 2015. ^ a b "Singapore GP – Saturday – Qualifying Session Report". GrandPrix.com. Inside F1, Inc. 25 September 2010. Archived from the original on 28 September 2010. Retrieved 24 October 2015. ^ a b c d Rae, Richard (25 September 2010). "Fernando Alonso puts Ferrari on pole in Singapore". BBC Sport. Archived from the original on 26 September 2010. Retrieved 24 October 2015. ^ a b c d e "Qualifying – selected team and driver quotes". Formula1.com. 25 September 2010. Archived from the original on 28 September 2010. Retrieved 24 October 2015. ^ a b c d e f "2010 Formula 1 Singel Singapore Grand Prix – Qualifying". Formula1.com. Archived from the original on 27 September 2010. Retrieved 24 October 2015. ^ a b c Elizalde, Pablo (25 September 2010). "Ferrari to replace Massa's engine". Autosport. Haymarket Publications. Archived from the original on 28 September 2010. Retrieved 26 September 2010. ^ a b c d e f g h i j "Singapore GP – Sunday – Team Quotes". GrandPrix.com. Inside F1, Inc. 26 September 2010. Archived from the original on 28 September 2010. Retrieved 19 September 2015. ^ a b c d e f g h i j k l m n "Singapore GP – Sunday – Race Notes". GrandPrix.com. Inside F1, Inc. 26 September 2010. Archived from the original on 28 September 2010. Retrieved 19 September 2015. ^ a b c d e f g h Ornstein, David (26 September 2010). "Singapore Grand Prix as it happened". BBC Sport. Archived from the original on 27 September 2010. Retrieved 19 September 2015. ^ a b c d e f Parkes, Ian (26 September 2010). "Frustation for Hamilton in Singapore". The Independent. Archived from the original on 28 September 2010. Retrieved 19 September 2010. ^ a b Noble, Jonathan (26 September 2010). "Webber 'very lucky' to finish race". Autosport. Haymarket Publications. Archived from the original on 1 October 2010. Retrieved 27 October 2015. ^ a b c Saunders, Nate (2 December 2014). "Top ten ... Fernando Alonso drives at Ferrari". ESPN. Archived from the original on 19 December 2014. Retrieved 28 October 2015. ^ a b c d "FIA post-race press conference – Singapore". Formula1.com. 26 September 2010. Archived from the original on 29 September 2010. Retrieved 27 October 2015. ^ a b Saunders, Will (5 May 2014). "Six of the Best: Fernando Alonso F1 wins". crash.net. Archived from the original on 3 October 2015. Retrieved 29 October 2015. ^ a b Brundle, Martin (27 September 2010). "Fernando Alonso steals a march on Red Bull". BBC Sport. Archived from the original on 30 September 2010. Retrieved 28 October 2015. ^ "Lewis Hamilton not changing style after Singapore crash". BBC Sport. 29 September 2010. Archived from the original on 30 September 2010. Retrieved 28 October 2015. ^ "Jordan: Schumacher deserves the sack". crash.net. 28 September 2010. Archived from the original on 14 November 2015. Retrieved 31 October 2015. ^ "Schumacher not sacked 'because we know him' – Brawn". motorsport.com. 29 September 2010. Archived from the original on 14 November 2015. Retrieved 31 October 2015. ^ ESPNF1 Staff (26 September 2010). "It wasn't safe to pit – Kovalainen". ESPN. Archived from the original on 29 September 2010. Retrieved 29 October 2015. ^ "Singapore Autosport Awards summary". motorsport.com. 9 December 2010. Archived from the original on 14 November 2015. Retrieved 28 October 2015. ^ a b "Sutil handed 20-second penalty". Autosport. Haymarket Publications. 26 September 2010. Archived from the original on 29 September 2010. Retrieved 26 September 2010. ^ a b Elizalde, Pablo (26 September 2010). "Hulkenberg given 20-second penalty". Autosport. Haymarket Publications. Archived from the original on 29 September 2010. Retrieved 26 September 2010. ^ "Williams Singapore GP review". motorsport.com. 29 September 2010. Archived from the original on 14 November 2015. Retrieved 29 October 2015. ^ "Senna cleared after collision with Kobayashi". GPUpdate. JHED Media BV. 26 September 2010. Archived from the original on 28 September 2010. Retrieved 5 November 2015. ^ a b "Singapore 2010 - Championship • STATS F1". www.statsf1.com. Retrieved 20 March 2019. Wikimedia Commons has media related to 2010 Singapore Grand Prix.